When a light-emitting diode is switched on, electrons are able to recombine with holes within the device, releasing energy in the form of photons. This effect is called electroluminescence, and the color of the light (corresponding to the energy of the photon) is determined by the energy band gap of the semiconductor. An LED is often small in area (less than 1 mm2), and integrated optical components may be used to shape its radiation pattern. LEDs have many advantages over incandescent light sources including lower energy consumption, longer lifetime, improved physical robustness, smaller size, and faster switching. However, LEDs powerful enough for room lighting are relatively expensive, and require more precise current and heat management than compact fluorescent lamp sources of comparable output. Electroluminescence as a phenomenon was discovered in 1907 by the British experimenter H. J. Round of Marconi Labs, using a crystal of silicon carbide and a cat's-whisker detector. Russian Oleg Losev reported creation of the first LED in 1927. His research was distributed in Russian, German and British scientific journals, but no practical use was made of the discovery for several decades. Rubin Braunstein of the Radio Corporation of America reported on infrared emission from gallium arsenide (GaAs) and other semiconductor alloys in 1955. Braunstein observed infrared emission generated by simple diode structures using gallium antimonide (GaSb), GaAs, indium phosphide (InP), and silicon-germanium (SiGe) alloys at room temperature and at 77 Kelvin. In 1961 American experimenters James R. Biard and Gary Pittman, working at Texas Instrument, found that GaAs emitted infrared radiation when electric current was applied. The two were able to establish the priority of their work based on engineering notebooks, and received the first US patent for the LED (although the light emitted was infrared). The wavelength of the light emitted, and thus its color, depends on the band gap energy of the materials forming the p-n junction. In silicon or germanium diodes, the electrons and holes recombine by a non-radiative transition, which produces no optical emission, because these are indirect band gap materials. The materials used for the LED have a direct band gap with energies corresponding to near-infrared, visible, or near-ultraviolet light. In general, a flat-surface uncoated LED semiconductor chip will emit light only perpendicular to the semiconductor's surface, and a few degrees to the side, in a cone shape referred to as the light cone, cone of light, or the escape cone. The maximum angle of incidence is referred to as the critical angle. When this angle is exceeded, photons no longer escape the semiconductor but are instead reflected internally inside the semiconductor crystal as if it were a mirror. Internal reflections can escape through other crystalline faces, if the incidence angle is low enough and the crystal is sufficiently transparent to not re-absorb the photon emission. But for a simple square LED with 90-degree angled surfaces on all sides, the faces all act as equal angle mirrors. In this case most of the light can not escape and is lost as waste heat in the crystal. Typical indicator LEDs are designed to operate with no more than 30–60 milliwatts (mW) of electrical power. Around 1999, Philips Lumileds introduced power LEDs capable of continuous use at one watt. These LEDs used much larger semiconductor die sizes to handle the large power inputs. Also, the semiconductor dies were mounted onto metal slugs to allow for heat removal from the LED die. One of the key advantages of LED-based lighting sources is high luminous efficacy. White LEDs quickly matched and overtook the efficacy of standard incandescent lighting systems. In 2002, Lumileds made five-watt LEDs available with a luminous efficacy of 18–22 lumens per watt (lm/W). For comparison, a conventional incandescent light bulb of 60–100 watts emits around 15 lm/W, and standard fluorescent lights emit up to 100 lm/W. A recurring problem is that efficacy falls sharply with rising current. This effect is known as droop and effectively limits the light output of a given LED, raising heating more than light output for higher current. As of 2012, the Lumiled catalog gives the following as the best efficacy for each color. The watt-per-watt value is derived using the luminosity function. In September 2003, a new type of blue LED was demonstrated by the company Cree Inc. to provide 24 mW at 20 milliamperes (mA). This produced a commercially packaged white light giving 65 lm/W at 20 mA, becoming the brightest white LED commercially available at the time, and more than four times as efficient as standard incandescents. In 2006, they demonstrated a prototype with a record white LED luminous efficacy of 131 lm/W at 20 mA. Nichia Corporation has developed a white LED with luminous efficacy of 150 lm/W at a forward current of 20 mA. Cree's XLamp XM-L LEDs, commercially available in 2011, produce 100 lm/W at their full power of 10 W, and up to 160 lm/W at around 2 W input power. In 2012, Cree announced a white LED giving 254 lm/W. Cree issued a press release on February 3, 2010 about a laboratory prototype LED achieving 208 lm/W at room temperature. The correlated color temperature was reported to be 4579 K. In December 2012 Cree issued another press release announcing commercial availability of 200 lm/W LED at room temperature. With nitrides containing aluminium, most often AlGaN and AlGaInN, even shorter wavelengths are achievable. Ultraviolet LEDs in a range of wavelengths are becoming available on the market. Near-UV emitters at wavelengths around 375–395 nm are already cheap and often encountered, for example, as black light lamp replacements for inspection of anti-counterfeiting UV watermarks in some documents and paper currencies. Shorter-wavelength diodes, while substantially more expensive, are commercially available for wavelengths down to 240 nm. As the photosensitivity of microorganisms approximately matches the absorption spectrum of DNA, with a peak at about 260 nm, UV LED emitting at 250–270 nm are to be expected in prospective disinfection and sterilization devices. Recent research has shown that commercially available UVA LEDs (365 nm) are already effective disinfection and sterilization devices. White light can be formed by mixing differently colored lights; the most common method is to use red, green, and blue (RGB). Hence the method is called multi-color white LEDs (sometimes referred to as RGB LEDs). Because these need electronic circuits to control the blending and diffusion of different colors, and because the individual color LEDs typically have slightly different emission patterns (leading to variation of the color depending on direction) even if they are made as a single unit, these are seldom used to produce white lighting. Nevertheless, this method is particularly interesting in many uses because of the flexibility of mixing different colors, and, in principle, this mechanism also has higher quantum efficiency in producing white light. There are several types of multi-color white LEDs: di-, tri-, and tetrachromatic white LEDs. Several key factors that play among these different methods, include color stability, color rendering capability, and luminous efficacy. Often, higher efficiency will mean lower color rendering, presenting a trade-off between the luminous efficiency and color rendering. For example, the dichromatic white LEDs have the best luminous efficacy (120 lm/W), but the lowest color rendering capability. However, although tetrachromatic white LEDs have excellent color rendering capability, they often have poor luminous efficiency. Trichromatic white LEDs are in between, having both good luminous efficacy (>70 lm/W) and fair color rendering capability. One of the challenges is the development of more efficient green LEDs. The theoretical maximum for green LEDs is 683 lumens per watt but as of 2010 few green LEDs exceed even 100 lumens per watt. The blue and red LEDs get closer to their theoretical limits. Multi-color LEDs offer not merely another means to form white light but a new means to form light of different colors. Most perceivable colors can be formed by mixing different amounts of three primary colors. This allows precise dynamic color control. As more effort is devoted to investigating this method, multi-color LEDs should have profound influence on the fundamental method that we use to produce and control light color. However, before this type of LED can play a role on the market, several technical problems must be solved. These include that this type of LED's emission power decays exponentially with rising temperature, resulting in a substantial change in color stability. Such problems inhibit and may preclude industrial use. Thus, many new package designs aimed at solving this problem have been proposed and their results are now being reproduced by researchers and scientists. Correlated color temperature (CCT) dimming for LED technology is regarded as a difficult task, since binning, age and temperature drift effects of LEDs change the actual color value output. Feedback loop systems are used for example with color sensors, to actively monitor and control the color output of multiple color mixing LEDs. This method involves coating LEDs of one color (mostly blue LEDs made of InGaN) with phosphors of different colors to form white light; the resultant LEDs are called phosphor-based white LEDs. A fraction of the blue light undergoes the Stokes shift being transformed from shorter wavelengths to longer. Depending on the color of the original LED, phosphors of different colors can be employed. If several phosphor layers of distinct colors are applied, the emitted spectrum is broadened, effectively raising the color rendering index (CRI) value of a given LED. Phosphor-based LED efficiency losses are due to the heat loss from the Stokes shift and also other phosphor-related degradation issues. Their luminous efficacies compared to normal LEDs depend on the spectral distribution of the resultant light output and the original wavelength of the LED itself. For example, the luminous efficacy of a typical YAG yellow phosphor based white LED ranges from 3 to 5 times the luminous efficacy of the original blue LED because of the human eye's greater sensitivity to yellow than to blue (as modeled in the luminosity function). Due to the simplicity of manufacturing the phosphor method is still the most popular method for making high-intensity white LEDs. The design and production of a light source or light fixture using a monochrome emitter with phosphor conversion is simpler and cheaper than a complex RGB system, and the majority of high-intensity white LEDs presently on the market are manufactured using phosphor light conversion. Among the challenges being faced to improve the efficiency of LED-based white light sources is the development of more efficient phosphors. As of 2010, the most efficient yellow phosphor is still the YAG phosphor, with less than 10% Stoke shift loss. Losses attributable to internal optical losses due to re-absorption in the LED chip and in the LED packaging itself account typically for another 10% to 30% of efficiency loss. Currently, in the area of phosphor LED development, much effort is being spent on optimizing these devices to higher light output and higher operation temperatures. For instance, the efficiency can be raised by adapting better package design or by using a more suitable type of phosphor. Conformal coating process is frequently used to address the issue of varying phosphor thickness. The phosphor-based white LEDs encapsulate InGaN blue LEDs inside phosphor coated epoxy. A common yellow phosphor material is cerium-doped yttrium aluminium garnet (Ce3+:YAG). In an organic light-emitting diode (OLED), the electroluminescent material comprising the emissive layer of the diode is an organic compound. The organic material is electrically conductive due to the delocalization of pi electrons caused by conjugation over all or part of the molecule, and the material therefore functions as an organic semiconductor. The organic materials can be small organic molecules in a crystalline phase, or polymers. Quantum dots (QD) are semiconductor nanocrystals that possess unique optical properties. Their emission color can be tuned from the visible throughout the infrared spectrum. This allows quantum dot LEDs to create almost any color on the CIE diagram. This provides more color options and better color rendering than white LEDs. Quantum-dot LEDs are available in the same package types as traditional phosphor-based LEDs.There are two types of schemes for QD excitation. One uses photo excitation with a primary light source LED (typically blue or UV LEDs are used). The other is direct electrical excitation first demonstrated by Alivisatos et al. One example of the photo-excitation scheme is a method developed by Michael Bowers, at Vanderbilt University in Nashville, involving coating a blue LED with quantum dots that glow white in response to the blue light from the LED. This method emits a warm, yellowish-white light similar to that made by incandescent bulbs. Quantum dots are also being considered for use in white light-emitting diodes in liquid crystal display (LCD) televisions. The major difficulty in using quantum dots-based LEDs is the insufficient stability of QDs under prolonged irradiation. In February 2011 scientists at PlasmaChem GmbH could synthesize quantum dots for LED applications and build a light converter on their basis, which could efficiently convert light from blue to any other color for many hundred hours. Such QDs can be used to emit visible or near infrared light of any wavelength being excited by light with a shorter wavelength. The structure of QD-LEDs used for the electrical-excitation scheme is similar to basic design of OLED. A layer of quantum dots is sandwiched between layers of electron-transporting and hole-transporting materials. An applied electric field causes electrons and holes to move into the quantum dot layer and recombine forming an exciton that excites a QD. This scheme is commonly studied for quantum dot display. The tunability of emission wavelengths and narrow bandwidth is also beneficial as excitation sources for fluorescence imaging. Fluorescence near-field scanning optical microscopy (NSOM) utilizing an integrated QD-LED has been demonstrated. LEDs are produced in a variety of shapes and sizes. The color of the plastic lens is often the same as the actual color of light emitted, but not always. For instance, purple plastic is often used for infrared LEDs, and most blue devices have colorless housings. Modern high power LEDs such as those used for lighting and backlighting are generally found in surface-mount technology (SMT) packages (not shown). These are mostly single-die LEDs used as indicators, and they come in various sizes from 2 mm to 8 mm, through-hole and surface mount packages. They usually do not use a separate heat sink. Typical current ratings ranges from around 1 mA to above 20 mA. The small size sets a natural upper boundary on power consumption due to heat caused by the high current density and need for a heat sink. Ultra-high-output: 20 mA at approximately 2 V or 4–5 V, designed for viewing in direct sunlight. LED in its on and off states. Medium-power LEDs are often through-hole-mounted and mostly utilized when an output of just a few lumen is needed. They sometimes have the diode mounted to four leads (two cathode leads, two anode leads) for better heat conduction and carry an integrated lens. An example of this is the Superflux package, from Philips Lumileds. These LEDs are most commonly used in light panels, emergency lighting, and automotive tail-lights. Due to the larger amount of metal in the LED, they are able to handle higher currents (around 100 mA). The higher current allows for the higher light output required for tail-lights and emergency lighting. High-power LEDs (HPLEDs) or high-output LEDs (HO-LEDs) can be driven at currents from hundreds of mA to more than an ampere, compared with the tens of mA for other LEDs. Some can emit over a thousand lumens. LED power densities up to 300 W/cm2 have been achieved. Since overheating is destructive, the HPLEDs must be mounted on a heat sink to allow for heat dissipation. If the heat from a HPLED is not removed, the device will fail in seconds. One HPLED can often replace an incandescent bulb in a flashlight, or be set in an array to form a powerful LED lamp. Some well-known HPLEDs in this category are the Nichia 19 series, Lumileds Rebel Led, Osram Opto Semiconductors Golden Dragon, and Cree X-lamp. As of September 2009, some HPLEDs manufactured by Cree Inc. now exceed 105 lm/W  (e.g. the XLamp XP-G LED chip emitting Cool White light) and are being sold in lamps intended to replace incandescent, halogen, and even fluorescent lights, as LEDs grow more cost competitive. The impact of Haitz's law which describes the exponential rise in light output of LEDs over time can be readily seen in year over year increases in lumen output and efficiency. For example, the CREE XP-G series LED achieved 105 lm/W in 2009, while Nichia released the 19 series with a typical efficacy of 140 lm/W in 2010. LEDs have been developed by Seoul Semiconductor that can operate on AC power without the need for a DC converter. For each half-cycle, part of the LED emits light and part is dark, and this is reversed during the next half-cycle. The efficacy of this type of HPLED is typically 40 lm/W. A large number of LED elements in series may be able to operate directly from line voltage. In 2009, Seoul Semiconductor released a high DC voltage LED capable of being driven from AC power with a simple controlling circuit. The low-power dissipation of these LEDs affords them more flexibility than the original AC LED design. Flashing LEDs are used as attention seeking indicators without requiring external electronics. Flashing LEDs resemble standard LEDs but they contain an integrated multivibrator circuit that causes the LED to flash with a typical period of one second. In diffused lens LEDs this is visible as a small black dot. Most flashing LEDs emit light of one color, but more sophisticated devices can flash between multiple colors and even fade through a color sequence using RGB color mixing. Bi-color LEDs are two different LED emitters in one case. There are two types of these. One type consists of two dies connected to the same two leads antiparallel to each other. Current flow in one direction emits one color, and current in the opposite direction emits the other color. The other type consists of two dies with separate leads for both dies and another lead for common anode or cathode, so that they can be controlled independently. Tri-color LEDs are three different LED emitters in one case. Each emitter is connected to a separate lead so they can be controlled independently. A four-lead arrangement is typical with one common lead (anode or cathode) and an additional lead for each color. RGB LEDs are Tri-color LEDs with red, green, and blue emitters, in general using a four-wire connection with one common lead (anode or cathode). These LEDs can have either common positive or common negative leads. Others however, have only two leads (positive and negative) and have a built in tiny electronic control unit. Decorative multicolor LEDs may incorporate several emitters of different colors supplied by only two lead-out wires. Colors are switched internally simply by varying the supply voltage. (In a cheap 'Melinera' garden lamp supplied by OWIM GmbH & Co KG in 2013 the LEDs are within a clear casting of 5mm diameter, 10mm long which encapsulates 3 LEDs which change between red, green and blue as the DC supply varies between about 2 volts and 3 volts). Alphanumeric LED displays are available in seven-segment, starburst and dot-matrix format. Seven-segment displays handle all numbers and a limited set of letters. Starburst displays can display all letters. Dot-matrix displays typically use 5x7 pixels per character. Seven-segment LED displays were in widespread use in the 1970s and 1980s, but rising use of liquid crystal displays, with their lower power needs and greater display flexibility, has reduced the popularity of numeric and alphanumeric LED displays. The current–voltage characteristic of an LED is similar to other diodes, in that the current is dependent exponentially on the voltage (see Shockley diode equation). This means that a small change in voltage can cause a large change in current. If the maximum voltage rating is exceeded by a small amount, the current rating may be exceeded by a large amount, potentially damaging or destroying the LED. The typical solution is to use constant-current power supplies, or driving the LED at a voltage much below the maximum rating. Since most common power sources (batteries, mains) are constant-voltage sources, most LED fixtures must include a power converter, at least a current-limiting resistor. However, the high resistance of 3 V coin cells combined with the high differential resistance of nitride-based LEDs makes it possible to power such an LED from such a coin cell without an external resistor. The vast majority of devices containing LEDs are "safe under all conditions of normal use", and so are classified as "Class 1 LED product"/"LED Klasse 1". At present, only a few LEDs—extremely bright LEDs that also have a tightly focused viewing angle of 8° or less—could, in theory, cause temporary blindness, and so are classified as "Class 2". The Opinion of the French Agency for Food, Environmental and Occupational Health & Safety (ANSES) of 2010, on the health issues concerning LEDs, suggested banning public use of lamps which were in the moderate Risk Group 2, especially those with a high blue component in places frequented by children. In general, laser safety regulations—and the "Class 1", "Class 2", etc. system—also apply to LEDs. While LEDs have the advantage over fluorescent lamps that they do not contain mercury, they may contain other hazardous metals such as lead and arsenic. A study published in 2011 states: "According to federal standards, LEDs are not hazardous except for low-intensity red LEDs, which leached Pb [lead] at levels exceeding regulatory limits (186 mg/L; regulatory limit: 5). However, according to California regulations, excessive levels of copper (up to 3892 mg/kg; limit: 2500), lead (up to 8103 mg/kg; limit: 1000), nickel (up to 4797 mg/kg; limit: 2000), or silver (up to 721 mg/kg; limit: 500) render all except low-intensity yellow LEDs hazardous." Efficiency: LEDs emit more light per watt than incandescent light bulbs. The efficiency of LED lighting fixtures is not affected by shape and size, unlike fluorescent light bulbs or tubes. Cycling: LEDs are ideal for uses subject to frequent on-off cycling, unlike fluorescent lamps that fail faster when cycled often, or HID lamps that require a long time before restarting. Dimming: LEDs can very easily be dimmed either by pulse-width modulation or lowering the forward current. This pulse-width modulation is why LED lights viewed on camera, particularly headlights on cars, appear to be flashing or flickering. This is a type of Stroboscopic effect. Lifetime: LEDs can have a relatively long useful life. One report estimates 35,000 to 50,000 hours of useful life, though time to complete failure may be longer. Fluorescent tubes typically are rated at about 10,000 to 15,000 hours, depending partly on the conditions of use, and incandescent light bulbs at 1,000 to 2,000 hours. Several DOE demonstrations have shown that reduced maintenance costs from this extended lifetime, rather than energy savings, is the primary factor in determining the payback period for an LED product. Focus: The solid package of the LED can be designed to focus its light. Incandescent and fluorescent sources often require an external reflector to collect light and direct it in a usable manner. For larger LED packages total internal reflection (TIR) lenses are often used to the same effect. However, when large quantities of light is needed many light sources are usually deployed, which are difficult to focus or collimate towards the same target. High initial price: LEDs are currently more expensive, price per lumen, on an initial capital cost basis, than most conventional lighting technologies. As of 2010, the cost per thousand lumens (kilolumen) was about $18. The price is expected to reach $2/kilolumen by 2015. The additional expense partially stems from the relatively low lumen output and the drive circuitry and power supplies needed. Temperature dependence: LED performance largely depends on the ambient temperature of the operating environment – or "thermal management" properties. Over-driving an LED in high ambient temperatures may result in overheating the LED package, eventually leading to device failure. An adequate heat sink is needed to maintain long life. This is especially important in automotive, medical, and military uses where devices must operate over a wide range of temperatures, which require low failure rates. Light quality: Most cool-white LEDs have spectra that differ significantly from a black body radiator like the sun or an incandescent light. The spike at 460 nm and dip at 500 nm can cause the color of objects to be perceived differently under cool-white LED illumination than sunlight or incandescent sources, due to metamerism, red surfaces being rendered particularly badly by typical phosphor-based cool-white LEDs. However, the color rendering properties of common fluorescent lamps are often inferior to what is now available in state-of-art white LEDs. Area light source: Single LEDs do not approximate a point source of light giving a spherical light distribution, but rather a lambertian distribution. So LEDs are difficult to apply to uses needing a spherical light field, however different fields of light can be manipulated by the application of different optics or "lenses". LEDs cannot provide divergence below a few degrees. In contrast, lasers can emit beams with divergences of 0.2 degrees or less. Electrical polarity: Unlike incandescent light bulbs, which illuminate regardless of the electrical polarity, LEDs will only light with correct electrical polarity. To automatically match source polarity to LED devices, rectifiers can be used. Droop: The efficiency of conventional InGaN based LEDs decreases as one increases current above a given level. Narrow band light sensors where LEDs operate in a reverse-bias mode and respond to incident light, instead of emitting light. See LEDs as light sensors. The low energy consumption, low maintenance and small size of LEDs has led to uses as status indicators and displays on a variety of equipment and installations. Large-area LED displays are used as stadium displays and as dynamic decorative displays. Thin, lightweight message displays are used at airports and railway stations, and as destination displays for trains, buses, trams, and ferries. One-color light is well suited for traffic lights and signals, exit signs, emergency vehicle lighting, ships' navigation lights or lanterns (chromacity and luminance standards being set under the Convention on the International Regulations for Preventing Collisions at Sea 1972, Annex I and the CIE) and LED-based Christmas lights. In cold climates, LED traffic lights may remain snow covered. Red or yellow LEDs are used in indicator and alphanumeric displays in environments where night vision must be retained: aircraft cockpits, submarine and ship bridges, astronomy observatories, and in the field, e.g. night time animal watching and military field use. Because of their long life, fast switching times, and their ability to be seen in broad daylight due to their high output and focus, LEDs have been used in brake lights for cars' high-mounted brake lights, trucks, and buses, and in turn signals for some time, but many vehicles now use LEDs for their rear light clusters. The use in brakes improves safety, due to a great reduction in the time needed to light fully, or faster rise time, up to 0.5 second faster than an incandescent bulb. This gives drivers behind more time to react. It is reported that at normal highway speeds, this equals one car length equivalent in increased time to react. In a dual intensity circuit (rear markers and brakes) if the LEDs are not pulsed at a fast enough frequency, they can create a phantom array, where ghost images of the LED will appear if the eyes quickly scan across the array. White LED headlamps are starting to be used. Using LEDs has styling advantages because LEDs can form much thinner lights than incandescent lamps with parabolic reflectors. With the development of high-efficiency and high-power LEDs, it has become possible to use LEDs in lighting and illumination. Replacement light bulbs have been made, as well as dedicated fixtures and LED lamps. To encourage the shift to very high efficiency lighting, the US Department of Energy has created the L Prize competition. The Philips Lighting North America LED bulb won the first competition on August 3, 2011 after successfully completing 18 months of intensive field, lab, and product testing. LED street lights are employed on poles and in parking garages. In 2007, the Italian village Torraca was the first place to convert its entire illumination system to LEDs. LEDs are used in aviation lighting. Airbus has used LED lighting in their Airbus A320 Enhanced since 2007, and Boeing plans its use in the 787. LEDs are also being used now in airport and heliport lighting. LED airport fixtures currently include medium-intensity runway lights, runway centerline lights, taxiway centerline and edge lights, guidance signs, and obstruction lighting. LEDs are also suitable for backlighting for LCD televisions and lightweight laptop displays and light source for DLP projectors (See LED TV). RGB LEDs raise the color gamut by as much as 45%. Screens for TV and computer displays can be made thinner using LEDs for backlighting. The lack of IR or heat radiation makes LEDs ideal for stage lights using banks of RGB LEDs that can easily change color and decrease heating from traditional stage lighting, as well as medical lighting where IR-radiation can be harmful. In energy conservation, the lower heat output of LEDs also means air conditioning (cooling) systems have less heat to dispose of, reducing carbon dioxide emissions. LEDs are small, durable and need little power, so they are used in hand held devices such as flashlights. LED strobe lights or camera flashes operate at a safe, low voltage, instead of the 250+ volts commonly found in xenon flashlamp-based lighting. This is especially useful in cameras on mobile phones, where space is at a premium and bulky voltage-raising circuitry is undesirable. LEDs are used in mining operations, as cap lamps to provide light for miners. Research has been done to improve LEDs for mining, to reduce glare and to increase illumination, reducing risk of injury for the miners. Light can be used to transmit broadband data, which is already implemented in IrDA standards using infrared LEDs. Because LEDs can cycle on and off millions of times per second, they can be wireless transmitters and access points for data transport. Lasers can also be modulated in this manner. Efficient lighting is needed for sustainable architecture. In 2009, a typical 13-watt LED lamp emitted 450 to 650 lumens, which is equivalent to a standard 40-watt incandescent bulb. In 2011, LEDs have become more efficient, so that a 6-watt LED can easily achieve the same results. A standard 40-watt incandescent bulb has an expected lifespan of 1,000 hours, whereas an LED can continue to operate with reduced efficiency for more than 50,000 hours, 50 times longer than the incandescent bulb. 2 over the same time span. A building’s carbon footprint from lighting can be reduced by 85% by exchanging all incandescent bulbs for new LEDs. LED light bulbs could be a cost-effective option for lighting a home or office space because of their very long lifetimes. Consumer use of LEDs as a replacement for conventional lighting system is currently hampered by the high cost and low efficiency of available products. 2009 DOE testing results showed an average efficacy of 35 lm/W, below that of typical CFLs, and as low as 9 lm/W, worse than standard incandescents. However, as of 2011, there are LED bulbs available as efficient as 150 lm/W and even inexpensive low-end models typically exceed 50 lm/W. The high initial cost of commercial LED bulbs is due to the expensive sapphire substrate, which is key to the production process. The sapphire apparatus must be coupled with a mirror-like collector to reflect light that would otherwise be wasted. The light from LEDs can be modulated very quickly so they are used extensively in optical fiber and free space optics communications. This includes remote controls, such as for TVs, VCRs, and LED Computers, where infrared LEDs are often used. Opto-isolators use an LED combined with a photodiode or phototransistor to provide a signal path with electrical isolation between two circuits. This is especially useful in medical equipment where the signals from a low-voltage sensor circuit (usually battery-powered) in contact with a living organism must be electrically isolated from any possible electrical failure in a recording or monitoring device operating at potentially dangerous voltages. An optoisolator also allows information to be transferred between circuits not sharing a common ground potential. Many sensor systems rely on light as the signal source. LEDs are often ideal as a light source due to the requirements of the sensors. LEDs are used as movement sensors, for example in optical computer mice. The Nintendo Wii's sensor bar uses infrared LEDs. Pulse oximeters use them for measuring oxygen saturation. Some flatbed scanners use arrays of RGB LEDs rather than the typical cold-cathode fluorescent lamp as the light source. Having independent control of three illuminated colors allows the scanner to calibrate itself for more accurate color balance, and there is no need for warm-up. Further, its sensors only need be monochromatic, since at any one time the page being scanned is only lit by one color of light. Touch sensing: Since LEDs can also be used as photodiodes, they can be used for both photo emission and detection. This could be used, for example, in a touch-sensing screen that registers reflected light from a finger or stylus. Many materials and biological systems are sensitive to or dependent on light. Grow lights use LEDs to increase photosynthesis in plants and bacteria and viruses can be removed from water and other substances using UV LEDs for sterilization. Other uses are as UV curing devices for some ink and coating methods, and in LED printers. Plant growers are interested in LEDs because they are more energy-efficient, emit less heat (can damage plants close to hot lamps), and can provide the optimum light frequency for plant growth and bloom periods compared to currently used grow lights: HPS (high-pressure sodium), metal-halide (MH) or CFL/low-energy. However, LEDs have not replaced these grow lights due to higher price. As mass production and LED kits develop, the LED products will become cheaper. LEDs have also been used as a medium-quality voltage reference in electronic circuits. The forward voltage drop (e.g., about 1.7 V for a normal red LED) can be used instead of a Zener diode in low-voltage regulators. Red LEDs have the flattest I/V curve above the knee. Nitride-based LEDs have a fairly steep I/V curve and are useless for this purpose. Although LED forward voltage is far more current-dependent than a good Zener, Zener diodes are not widely available below voltages of about 3 V.
LEDs are an essential part of the illumination system in digital microscopes, such as those which can be directly attached to the USB port of a computer. Such USB microscopes and endoscopes enable images to be recorded and stored directly on the computer without use of a separate camera. LED elements tend to be small and can be placed with high density over flat or even-shaped substrates (PCBs etc.) so that bright and homogeneous sources that direct light from tightly controlled directions on inspected parts can be designed. This can often be obtained with small, low-cost lenses and diffusers, helping to achieve high light densities with control over lighting levels and homogeneity. LED sources can be shaped in several configurations (spot lights for reflective illumination; ring lights for coaxial illumination; back lights for contour illumination; linear assemblies; flat, large format panels; dome sources for diffused, omnidirectional illumination). LEDs can be easily strobed (in the microsecond range and below) and synchronized with imaging. High-power LEDs are available allowing well-lit images even with very short light pulses. This is often used to obtain crisp and sharp “still” images of quickly moving parts. LEDs come in several different colors and wavelengths, allowing easy use of the best color for each need, where different color may provide better visibility of features of interest. Having a precisely known spectrum allows tightly matched filters to be used to separate informative bandwidth or to reduce disturbing effects of ambient light. LEDs usually operate at comparatively low working temperatures, simplifying heat management and dissipation. This allows using plastic lenses, filters, and diffusers. Waterproof units can also easily be designed, allowing use in harsh or wet environments (food, beverage, oil industries). LEDs used on a train for both overhead lighting and destination signage. ^ "The life and times of the LED — a 100-year history". The Optoelectronics Research Centre, University of Southampton. April 2007. Retrieved September 4, 2012. ^ Nosov, Yu. R. (2005). "О. В. Лосев – изобретатель кристадина и светодиода" [O. V. Losev - the Inventor of Crystodyne and Light-emitting Diode]. Электросвязь (in Russian) (5): 63. ^ Novikov, M. A. (2004). "Олег Владимирович Лосев — пионер полупроводниковой электроники" [Oleg Vladimirovich Losev — a Pioneer of Semiconductor Electronics] (PDF). Физика твердого тела (in Russian) 46 (1). "Кроме того, О.В. Лосеву удалось очень далеко продвинуться в понимании физики этих явлений в условиях, когда еще не была создана зонная теория полупроводников. Так что современные защитники приоритета Роунда вряд ли имеют право оспоривать выдающийся вклад нашего соотечественника в эту область физики и особенно в изобретение светодиода. Ведь изобретателями радио считаются по праву Попов и Маркони, хотя всем известно, что радиоволны первым наблюдал Герц. И таких примеров в истории науки много." ^ "The first LEDs were infrared (invisible)". Smithsonian National Museum of American History. October 2007. Retrieved July 24th, 2013. ^ "Inventor of Long-Lasting, Low-Heat Light Source Awarded $500,000 Lemelson-MIT Prize for Invention". Washington, D.C. Massachusetts Institute of Technology. April 21, 2004. Retrieved December 21, 2011. ^ a b c Schubert, E. Fred (2003). "1". Light-Emitting Diodes. Cambridge University Press. ISBN 0-8194-3956-8. ^ "LED". The American heritage science dictionary. Houghton Mifflin Company. 2005. led and LED. ^ a b "Nick Holonyak, Jr. 2004 Lemelson-MIT Prize Winner". Lemenson-MIT Program. Retrieved August 13, 2007. ^ Round, H. J. (1907). "A Note on Carborundum". Electrical World 19: 309. ^ Losev, O. V. (1927). Telegrafiya i Telefoniya bez Provodov 44: 485–494. ^ Zheludev, N. (2007). "The life and times of the LED: a 100-year history" (free-download PDF). Nature Photonics 1 (4): 189–192. Bibcode:2007NaPho...1..189Z. doi:10.1038/nphoton.2007.34. ^ Lee, Thomas H. (2004). The design of CMOS radio-frequency integrated circuits. Cambridge University Press. p. 20. ISBN 0-521-83539-9. ^ Braunstein, Rubin (1955). "Radiative Transitions in Semiconductors". Physical Review 99 (6): 1892. Bibcode:1955PhRv...99.1892B. doi:10.1103/PhysRev.99.1892. ^ "The first LEDs were infrared (invisible)". The Quartz Watch. The Lemelson Center. Retrieved August 13, 2007. ^ Holonyak Nick; Bevacqua, S. F. (December 1962). "Coherent (Visible) Light Emission from Ga(As1−x Px) Junctions". Applied Physics Letters 1 (4): 82. Bibcode:1962ApPhL...1...82H. doi:10.1063/1.1753706. ^ Wolinsky, Howard (February 5, 2005). "U. of I. 's Holonyak out to take some of Edison's luster". Chicago Sun-Times. Archived from the original on February 28, 2008. Retrieved July 29, 2007. ^ Perry, T.S. (1995). "M. George Craford [biography]". IEEE Spectrum 32 (2): 52–55. doi:10.1109/6.343989. ^ "Brief Biography — Holonyak, Craford, Dupuis" (PDF). Technology Administration. Retrieved May 30, 2007. ^ Pearsall, T. P.; Miller, B. I.; Capik, R. J.; Bachmann, K. J. (1976). "Efficient, Lattice-matched, Double Heterostructure LEDs at 1.1 mm from GaxIn1-xAsyP1-y by Liquid-phase Epitaxy". Appl. Phys. Lett. 28 (9): 499. Bibcode:1976ApPhL..28..499P. doi:10.1063/1.88831. ^ LED there be light. Electrooptics.com (June–July 2006). Retrieved on March 16, 2012. ^ "The LED Illumination Revolution". Forbes. February 27, 2008. Archived from the original on January 3, 2013. ^ LED Thermal Management. Lunaraccents.com. Retrieved on March 16, 2012. ^ Nakamura, S.; Mukai, T. and Senoh, M. (1994). "Candela-Class High-Brightness InGaN/AlGaN Double-Heterostructure Blue-Light-Emitting-Diodes". Appl. Phys. Lett. 64 (13): 1687. Bibcode:1994ApPhL..64.1687N. doi:10.1063/1.111832. ^ "Haitz's law". Nature Photonics 1 (1): 23. 2007. Bibcode:2007NaPho...1...23.. doi:10.1038/nphoton.2006.78. ^ Colin J. Humphreys' cheap LED production method. Rsc.org (January 30, 2009). Retrieved on March 16, 2012. ^ "Optical Properties of Silicon". pvcdrom.pveducation.org. ^ Refraction — Snell's Law. Interactagram.com. Retrieved on March 16, 2012. ^ Capper, Peter and Mauk, Michael (2007). Liquid phase epitaxy of electronic, optical, and optoelectronic materials. Wiley. p. 389. ISBN 0-470-85290-9. "faceted structures are of interest for solar cells, LEDs, thermophotovoltaic devices, and detectors in that nonplanar surfaces and facets can enhance optical coupling and light-trapping effects, [with example microphotograph of a faceted crystal substrate]." ^ Dakin, John and Brown, Robert G. W. (eds.) Handbook of optoelectronics, Volume 2, Taylor & Francis, 2006 ISBN 0-7503-0646-7 p. 356, "Die shaping is a step towards the ideal solution, that of a point light source at the center of a spherical semiconductor die." ^ Schubert, E. Fred (2006) Light-emitting diodes, Cambridge University Press, ISBN 0-521-86538-7 p. 97, "Epoxy Encapsulants", "The light extraction efficiency can be enhanced by using dome-shaped encapsulants with a large refractive index." ^ a b Smart Lighting: New LED Drops The 'Droop'. Sciencedaily.com (January 13, 2009). Retrieved on March 16, 2012. ^ Justin Iveland, Lucio Martinelli, Jacques Peretti, James S. Speck, Claude Weisbuch. "Cause of LED Efficiency Droop Finally Revealed". Physical Review Letters, 2013. Science Daily. Retrieved 23 April 2013. ^ "All in 1 LED Lighting Solutions Guide", philipslumileds.com, p. 15. ^ "Nichia Unveils White LED with 150 lm/W Luminous Efficiency". Tech-On!. December 21, 2006. Retrieved August 13, 2007. 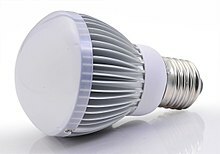 ^ "Cree Sets New Record for White LED Efficiency", Tech-On, April 23, 2012. ^ DOE Solid-State Lighting CALiPER Program Summary of Results: Round 9 of Product Testing. (PDF). U.S. Department of Energy. October 2009. ^ "Cree Breaks 200 Lumen Per Watt Efficacy Barrier". Durham, N.C: CREE. February 3, 2010. Retrieved March 22, 2010. ^ "Cree Reaches LED Industry Milestone with 200 Lumen-Per-Watt LED". Durham, N.C.: CREE. December 18, 2012. Retrieved December 30, 2012. ^ Narendran, N. and Y. Gu (2005). "Life of LED-based white light sources". IEEE/OSA Journal of Display Technology 1 (1): 167–171. Bibcode:2005JDisT...1..167N. doi:10.1109/JDT.2005.852510. ^ a b Conway, K. M. and J. D. Bullough. 1999. Will LEDs transform traffic signals as they did exit signs? Proceedings of the Illuminating Engineering Society of North America Annual Conference (pp. 1–9), New Orleans, Louisiana, August 9–11. New York, NY: Illuminating Engineering Society of North America. ^ Narendran, N., J. Brons, and J. Taylor. 2006. Energy-efficient Alternative for Commercial Refrigeration. Project report prepared for the New York State Energy Research and Development Authority. ^ ASSIST. 2008. Recommendations for Testing and Evaluating Luminaires for Refrigerated and Freezer Display Cases. Vol. 5, Issue 1. Troy, N.Y.: Lighting Research Center. ^ Narendran, N. 2006. Field Test DELTA Snapshots: LED Lighting In Freezer Cases. Troy, N.Y.: Lighting Research Center. ^ Gu, Y., A. Baker, and N. Narendran. 2007. Investigation of thermal management technique in blue LED airport taxiway fixtures. Seventh International Conference on Solid State Lighting, Proceedings of SPIE 6669: 66690U. ^ OSRAM: green LED. osram-os.com. Retrieved on March 16, 2012. ^ "LEDs move into the ultraviolet". physicsworld.com. May 17, 2006. Retrieved August 13, 2007. ^ How to Wire/Connect LEDs. Llamma.com. Retrieved on March 16, 2012. ^ LED types by Color, Brightness, and Chemistry. Donklipstein.com. Retrieved on March 16, 2012. ^ Major Business and Product Milestones. Cree.com. Retrieved on March 16, 2012. ^ Cooke, Mike (April/May 2010). "Going Deep for UV Sterilization LEDs". Semiconductor Today 5 (3): 82. ^ Wold, J. H. and Valberg, A. (2000). "The derivation of XYZ tristimulus spaces: A comparison of two alternative methods". Color Research & Application 26 (S1): S222. doi:10.1002/1520-6378(2001)26:1+<::AID-COL47>3.0.CO;2-4. ^ Schubert, E. Fred and Kim, Jong Kyu (2005). "Solid-State Light Sources Getting Smart". Science 308 (5726): 1274. Bibcode:2005Sci...308.1274S. doi:10.1126/science.1108712. ^ Thomas Nimz, Fredrik Hailer and Kevin Jensen (2012). Sensors and Feedback Control of Multi-Color LED Systems (PDF). LED Professional. pp. 2–5. ISSN 1993-890X. ^ Tanabe, S. and Fujita, S. and Yoshihara, S. and Sakamoto, A. and Yamamoto, S. (2005). "YAG glass-ceramic phosphor for white LED (II): luminescence characteristics". Proc. Of SPIE. Fifth International Conference on Solid State Lighting 5941: 594112. doi:10.1117/12.614681. ^ Ohno, Y. (2004). "Color rendering and luminous efficacy of white LED spectra". Proc. Of SPIE. Fourth International Conference on Solid State Lighting 5530: 89. doi:10.1117/12.565757. ^ "Accidental Invention Points to End of Light Bulbs". LiveScience.com. October 21, 2005. Retrieved January 24, 2007. ^ Inman, Mason (February 1, 2008). "Crystal coat warms up LED light". newscientist.com. Retrieved January 30, 2012. ^ What is the difference between 3528 LEDs and 5050 LEDs |SMD 5050 SMD 3528. Flexfireleds.com. Retrieved on March 16, 2012. ^ LED-design. Elektor.com. Retrieved on March 16, 2012. ^ "Luminus Products". Luminus Devices, Inc. Retrieved October 21, 2009. ^ "Luminus Products CST-90 Series Datasheet". Luminus Devices, Inc. Retrieved October 25, 2009. ^ a b Xlamp Xp-G Led. Cree.com. Retrieved on March 16, 2012. ^ "Seoul Semiconductor launches AC LED lighting source Acriche". LEDS Magazine. November 17, 2006. Retrieved February 17, 2008. ^ a b Visibility, Environmental, and Astronomical Issues Associated with Blue-Rich White Outdoor Lighting (PDF). International Dark-Sky Association. May 4, 2010. ^ Schubert, E. Fred (2005). "Chapter 4". Light-Emitting Diodes. Cambridge University Press. ISBN 0-8194-3956-8. ^ "Visible LED Device Classifications". Datasheetarchive.com. Retrieved on March 16, 2012. ^ Opinion of the French Agency for Food, Environmental and Occupational Health & Safety, ANSES Opinion, October 19, 2010. ^ "Eye Safety and LED (Light Emitting Diode) diffusion": "The relevant standard for LED lighting is EN 60825-1:2001 (Safety of laser products) ... The standard states that throughout the standard "light emitting diodes (LED) are included whenever the word "laser" is used." ^ "Solid-State Lighting: Comparing LEDs to Traditional Light Sources". eere.energy.gov. ^ "Dialight Micro LED SMD LED "598 SERIES" Datasheet" (PDF). dialight.com. ^ "Data Sheet — HLMP-1301, T-1 (3 mm) Diffused LED Lamps". Avago Technologies, Inc. Retrieved May 30, 2010. ^ Narra, Prathyusha and Zinger, D.S. (2004). "An effective LED dimming approach". Industry Applications Conference, 2004. 39th IAS Annual Meeting. Conference Record of the 2004 IEEE 3: 1671–1676. doi:10.1109/IAS.2004.1348695. ISBN 0-7803-8486-5. ^ "LED Lighting Explained: Questions and Answers". energy.ltgovernors.com. ^ Hecht, E. (2002). Optics (4 ed.). Addison Wesley. p. 591. ISBN 0-19-510818-3. ^ Raloff, Janet (May 27, 2006). "Light Impacts: Science News". Sciencenews.org. ^ The LED's dark secret. EnergyDaily. Retrieved on March 16, 2012. ^ European Photonics Industry Consortium (EPIC). ^ Dziekan, Mike (February 6, 2009) "Using Light-Emitting Diodes as Sensors". soamsci.or. ^ Ben-ezra, Moshe; Wang, Jiaping; Wilburn, Bennett; Li, Xiaoyang and Ma, Le. "An LED-only BRDF Measurement Device"
^ Eisenberg, Anne (June 24, 2007). "In Pursuit of Perfect TV Color, With L.E.D.’s and Lasers". New York Times. Retrieved April 4, 2010. ^ "CDC - NIOSH Publications and Products - Impact: NIOSH Light-Emitting Diode (LED) Cap Lamp Improves Illumination and Decreases Injury Risk for Underground Miners". cdc.gov. Retrieved May 3, 2013. ^ Green, Hank (October 9, 2008). "Transmitting Data Through LED Light Bulbs". EcoGeek. Retrieved February 15, 2009. ^ a b DOE Solid-State Lighting CALiPER Program Summary of Results: Round 7 of Product Testing (PDF). U.S. Department of Energy. February 2009. ^ US DOE EIA: Electricity Emission Factors. Eia.doe.gov. Retrieved on March 16, 2012. ^ Dietz, Yerazunis, and Leigh (2004). Very Low-Cost Sensing and Communication Using Bidirectional LEDs. ^ Goins, GD and Yorio, NC and Sanwo, MM and Brown, CS (1997). "Photomorphogenesis, photosynthesis, and seed yield of wheat plants grown under red light-emitting diodes (LEDs) with and without supplemental blue lighting". Journal of Experimental Botany 48 (7): 1407. doi:10.1093/jxb/48.7.1407. Shuji Nakamura, Gerhard Fasol, Stephen J Pearton (2000). The Blue Laser Diode: The Complete Story. Springer Verlag. ISBN 3-540-66505-6. This page was last modified on 3 October 2013 at 01:33.